Instruction which includes instruments is known to enhance a child’s appreciation of music. But, musical instruments are not always within the reach of families with modest means. A program launched by the Central Kentucky Youth Orchestra provides the tools needed by low-income music students. Every day after school, some 23 second and third graders from Arlington Elementary cross the street and climb the stairs to a room inside Embrace Church. They are participants in the first class of the North Limestone Music Works. 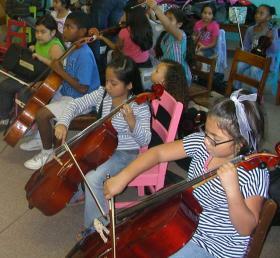 The children are learning to play violins, violas, and the cello. Program director Rachel Hockenberry says their main focus is on performing with an orchestra. But, there’s also a good dose of information on classical composer. “Right now we’re teaching them things like note reading, being able to recognize lines and spaces on the staff. We’re doing a little bit of music history as well, learning about the composers of the pieces that we study. We’re doing a lot with Tchaikovsky’s fourth symphony right now, so the kids are learning a little bit about Russia and a little bit about Tchaikovsky,” said Hockenberry. North Limestone Music Works is inspired by the musical and social philosophy of Venezuela’s national system of youth orchestras and choirs. It’s the same program that graduated Gustavo Dudamel , who directs the Los Angeles Philharmonic. Hockenberry made a trip to the South American country to learn more about the program. “It’s based off of a music philosophy called El Sistema and it’s based on the philosophy of social change and youth development through music education,” added Hockenberry. Teacher Paul Reich offers some instruction to students. Since this is the beginning of a brand new program, Reich says everyone involved, including teachers, are learning at the same time. He says maintaining student attention was a little difficult at first. Reich says music education helped mold him into the person he is today. “Well music is a wonderful vehicle in teaching structure in one’s life. Myself, for example, I was an ok student, but once I started playing music, I was a straight A student from that point forward,” said Reich. After some work on written assignments, the stringed instruments, most of them donated, are distributed among the students. While there’s excitement about pulling the bow across the strings, eight year old Vondra Smith admits there are challenges as well. “The really thing that’s hard about this is to me is ‘Twinkle’ because I can’t get it in my brain, that fast, Twinkle Little Star. I know it’s easy, but it’s hard to maneuver to,” said Smith. The 23 first-year participants in the Music Works program got started in mid August. Seven year old Emily Sandoval says playing conditions made it difficult to focus on musical instruction. “It’s kind of hard to play the violin, or viola, or cello inside the hot room. You have to get used to the temperature, but the most hardest thing is to remember all the notes,” explained Sandoval. Success in a new program like this can be measured in a variety of ways. Teacher Paul Reich says it’s a success when, during a concert together, everyone plays in-tune and on time. But, he adds, if the group doesn’t get there completely, that’s ok.
“A successful year is just these kids having fun and enjoying music. This isn’t really a contest at who can be the best at this point, this is all about giving them something to look up to. If I can see each kid is looking up to something, then I consider that a successful year,” said Reich. Too often musical instruments are unaffordable, especially for low-income families. And at Arlington Elementary, a large portion of students qualify for the free and reduced lunches. So without the North Limestone Music Works program, Director Rachel Hockenberry worries many of her students wouldn’t have access to this type of musical instruction. “Usually to get a very high quality music education, you have to be able to have private lessons, you have to be able to have you own instrument, you have to be able to make it to the youth orchestra rehearsals once a week. You know, all of these things require time and money and certain other aspects that not everybody has aspects to. So, our goal is to eliminate those access barriers with this program,” said Hockenberry. Hockenberry says the aim is for these first year music works students to continue in the program right through high school graduation. She says long term plans call for adding more students next year and eventually taking the program to other schools. We invite you to visit: greatmusicalinstruments.net for affordable quality musical instruments in a variety of sizes and colors.